If you want to visit Sylt, Germany you will need to know all about it. It is a place where you will find many of the rich and famous visiting throughout the year. This area is a North Sea island that is not easy to get to. In fact the only way to get there is to take the train that works with the dam that is connected to the mainland. You will also have the option of taking your car onto the train. The ride is only thirty-five minutes long and you can stay seated comfortably in your car during the trip. Once there you will find that there are many things to do here are just a few examples of what to do while in Sylt. There are many beaches for you to enjoy. You can take walks or just sit on the beach and watch the water. If you like to take long walks on the beach the one that is in Hornum is recommended. You can park at the harbor in the centre and start your walk from there. Get on the beach and head south. You will pass a surf school and a restaurant. If you are hungry you can stop and grab something to eat. You will also find a lighthouse located here. If you keep walking you will reach the end of the beach and you will be as far south as Sylt will take you. Another popular beach for taking walks on is Sansibar. This is another beautiful beach and is very popular. 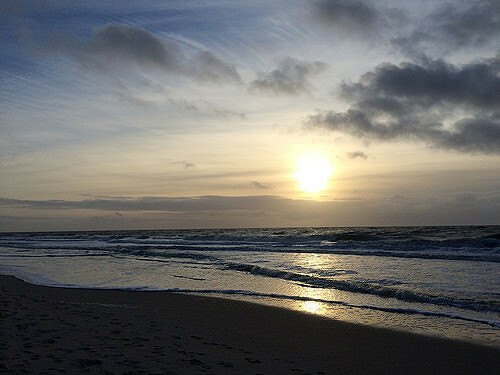 Most tourists who visit Sylt will usually visit this beach at least one time. One thing that Sylt does not have a lack of is a restaurant. You will find excellent restaurants to enjoy all throughout Sylt. A very popular restaurant is known as Bodendorf’s, which is in the Landhaus Stricker. You might have to go a little off of the route that you planned on taking, as it is located in a residential area in Tinnum but you will not be disappointed. The restaurant offers a cozy atmosphere with a very friendly staff and great food. A second restaurant you will definitely want to check out is the restaurant Stronholt located in Hornum. This restaurant offers a wonderful view of the harbor and on clear days you can even see the island Fohr. This restaurant also has a very friendly staff and cozy atmosphere. The experience center call Naturgewalten is something that you should visit whether you are young or old. You can see how many different things are created that is weather related while you are here. Another must see if the lighthouse in Hornum. This is a very popular landmark that has been photographed over and over again. You can enjoy a tour of the lighthouse while climbing all the way to the top. The tours are offered on Monday, Wednesday and Thursday at several different times during the day. However you should get your tickets quick because the tours are only ten people at a time. Finally one of the most popular things to do is to watch the seals and the whales. This can be done by simply walking on the beach and watching the water. The chances are quite high that you will see a gray seal or even a whale. If you do not feel like walking you can join a boat tour that will take you to watch the seals. The above examples are just a few of the many different things that can be done while visiting Sylt, Germany. There are many other things as well it is a personal preference as to what you like and want to do.